I'm Katie, aka Overtired Mama. 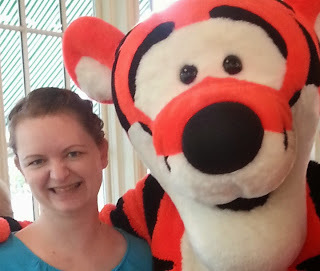 My friend Tigger and I.
I'm a wife and mommy of one from the East Coast of Canada. I work full-time, and maintain a part-time job as a fitness instructor. I am also working on my MBA. These may or may not be some of the reasons I am so tired, but it's worth it. I may be "overtired", but I always find the energy to travel, find travel deals, and share my best tips and tricks for successful vacations, on a budget. I love to promote the idea that budget travel doesn't mean "sub-par" travel. You can have a great vacation AND save money. I'm always open to feedback, comments or suggestions! Feel free to get in touch anytime via email at katie.overtiredmama@gmail.com. For businesses/orgainziations: I am open to writting sponsored content, but it has to be the right fit. I write primarily about travel, with a particular focus on budget travel. Contact me if you would like to see if we are a good fit to work together: katie.overtiredmama@gmail.com. Looking for a guest blogger for your website/blog? I'm always open to new opportunities, please contact me with your request: katie.overtiredmama@gmail.com.